I have two cards in the book, one of them showcased here created with a darling Saturated Canary image, the other one with a darling Whimsy image. To help kick off the celebration of the new book… each designer on the hop is giving away an autographed copy of the book…signed not only by Colleen and Marianne, but by the individual designer too! Please comment on this post for your chance to win your copy of mine! Commenting will be closed at midnight on Friday, October 26th. Winners will be announced on the individual designer’s blog. Can’t wait for your copy? Copic Coloring Guide Level 3: People is now available at many stamping and scrapbooking stores. Visit your local store today and ask about availability. It is also sold through the Annie’s catalog, accessible online at Annie’s. Thanks so much for stopping by! Good luck on winning a copy of that book! Have a wonderful weekend! Hi there! Sorry I am so quiet lately. Another book series has me in it’s grip. I have to stop reading once this one is over and get back in my stamping groove. 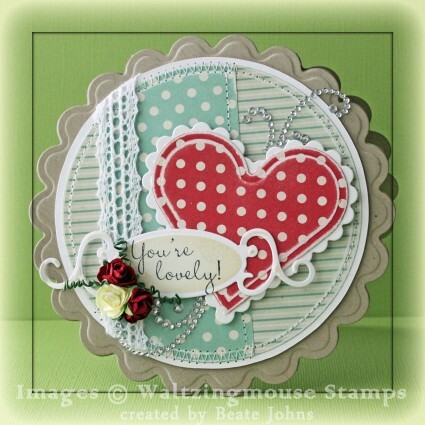 It’s my turn to share on the Spellbinders blog today. This week is all about techniques and I used the new Hexagon dies to create a quilted background. I hope you have time to check out the entire photo tutorial. 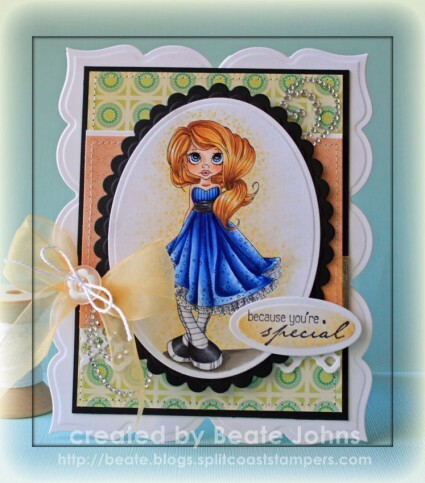 Becky Fleck has new card sketches on her Pagemaps site today. 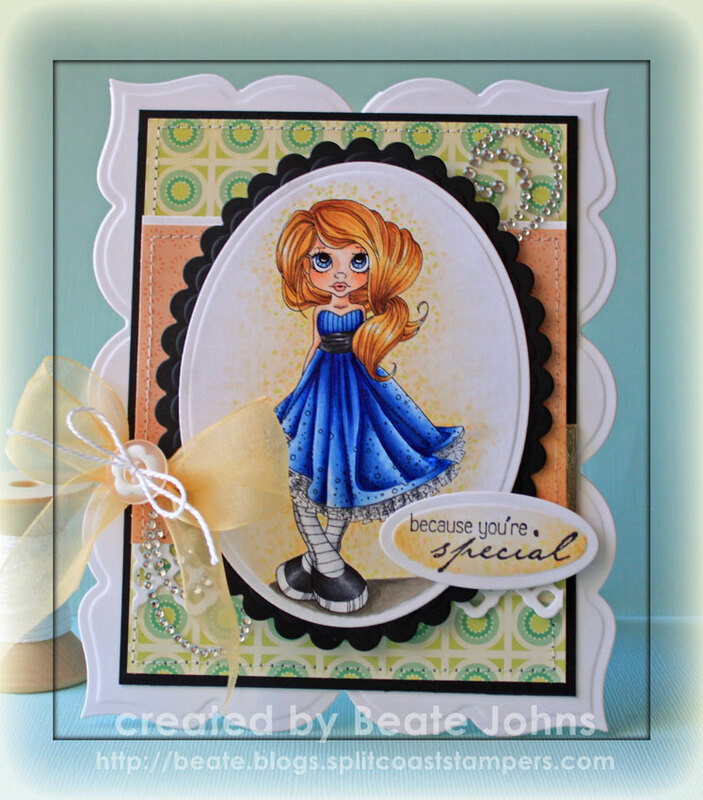 I created this card with one of those gorgeous new sketches as well as one of her Spellbinders die packs. 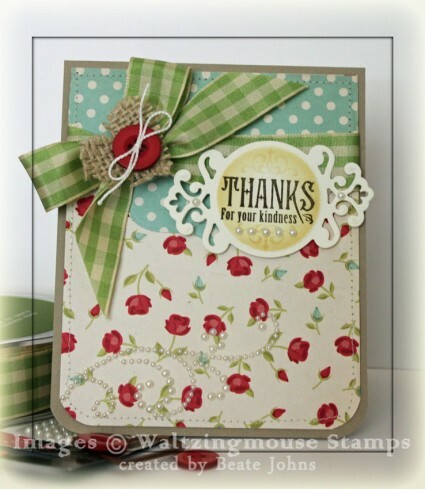 For my sample I used Cosmo Cricket Baby Jane paper. I cut and embossed pieces with Pagemaps Whimsy dies and sanded the edges to create the bird. Another piece of Baby Jane paper was cut and embossed with a Standard Circle Nestabilities die. Again the edges were sanded before the circle was adhered to a piece of Neenah Solar White cardstock, cut and embossed with a Tear Drop Circle Nestabilities die. The bottom corner of a 4″ x 5 1/4″ piece of Baby Jane paper were rounded before the edges were sanded and stitched. The layer was adhered to the card base, a 5 1/2″ x 8 1/2″ piece of white cardstock, folded in half. The left side of a Baby Jane paper strip was cut and embossed with a Classic Square Nestabilities die to create a banner edge. The strip was adhered to the center of the card layers. A short strip of white cardstock was cut and embossed with a Classic Scallop Edgeabilities as well as a Classic Decorative Insert 5 die. The white paper strip was adhered over the left hand side of the strip and topped with a button. A sentiment from Flourishes Tag Lines was stamped in Tuxedo Black Memento Ink on white cardstock that had been cut and embossed with a Nested Lacey Pennants die. The sentiment was adhered to the right hand side of the card. Parts of a Finesse Rhinestone Swirl finish off the card. Hello and welcome to Day 6 of our April Rubber & Die Release Showcase! You know I had to get all of the new Elisabeth Bell stamps from this release. The images are just too cute. So today I am sharing a card made with the new image called April Sunshine. I stamped the darling girl n Tuxedo Black Memento Ink on Neenah Solar White cardstock, cut and embossed it with a Petite Oval Nestabilities die and colored it with Copic Markers (Umbrella and flowers: Y00, Y11, Y13, Y15, Y17 handle/basket/sentiment: E31, E33, E35, E37 Shirt/grass: YG00, YG01, YG03, YG17 Jeans: B91, B93, B95, B97, B00 Flower/watering can/bow: YR07, R24, R27 Skin: E50, E51, E53, BV00 Hair: N4, N6, N6, N10 Apron: C00, C1, C3 Background: B0000, B000). Two pieces of Cosmo Cricket Tea for Two patterned paper were cut and embossed with the largest Label 25 Nestabilities die. The edges were sanded and stitched before first White May Arts Crochet Lace, then May Arts ribbon was tied around the spot where the papers met. The layers were adhered to the card base, cut and embossed with the same Label 25 Nestabilities die. The image layer was adhered over the card base with dimensional adhesive. A sentiment from the Vintage Birthday Tabs was stamped in Tuxedo Black Ink, colored with Copic Markers, cut out and adhered right under the image layer. Parts of a Fancy That! Border Bling and Sleek Strips Silver Rhinestones finish off the card. 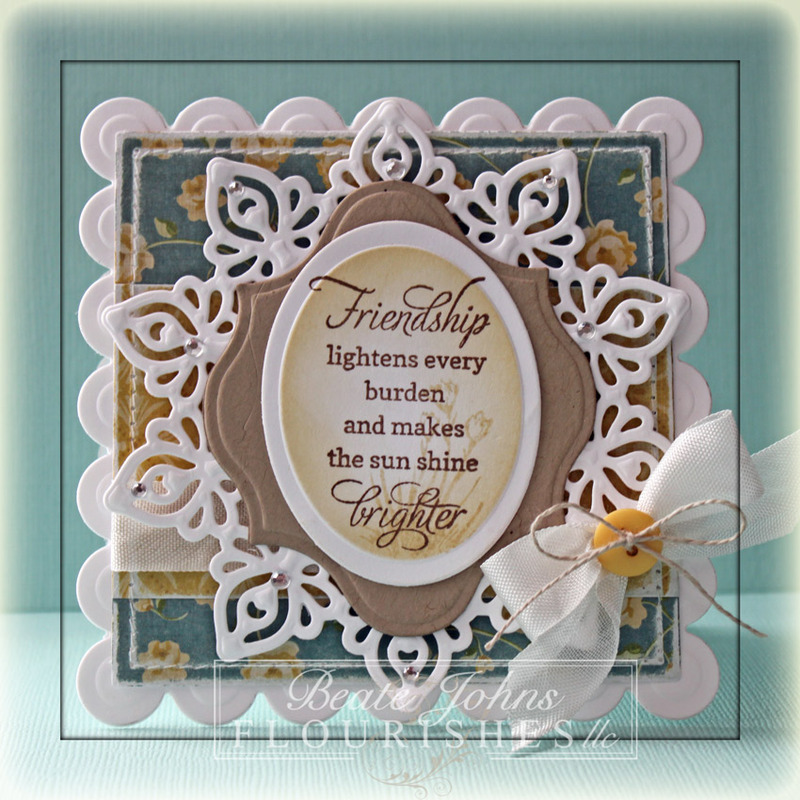 Today’s Bring Back Beautiful challenge is all about friendship. Make sure you check out the Flourishes blog and the new team members! They are amazing stampers and I can’t see what they will create. For my sample I used a sentiment from Sweet Days of Summer. It was stamped in Rich Cocoa Memento Ink on a piece of Neenah Solar White cardstock, cut and embossed with the third smallest of the Large Classic Oval Nestabilities die. The edges were first sponged with Antique Linen, then with a Frayed Burlap Distress Ink. The oval was layered on a piece of Kraft cardstock, cut and embossed with a Label 13 Nestabilities die, then on white cardstock, cut and embossed with a Persian Motifs Shapeabilities die (I thought it would go great with the sentiment. It almost looks like a sun die, doesn’t it?). Cosmo Cricket Tea for Two patterned paper was cut and embossed with the largest Classic Square Nestabilities die. The edges were sanded and stitched. Seam binding was tied around the paper square before it was adhered to a piece of white cardstock, cut and embossed with the largest Lg. Scallop Square Nestabilities die. The card front was adhered to a card base, cut and embossed with the same large Scallop Square Nestabilities die. A button was tied to the bow with Linen Thread. Rhinestones from Baby Bling and Sleek Strips Silver Rhinestones finish off the card. I haven’t played along the Waltzingmouse Sketch challenge. When I saw yesterday’s sketch I just had to play. A heart inside a circle? LOVE that! 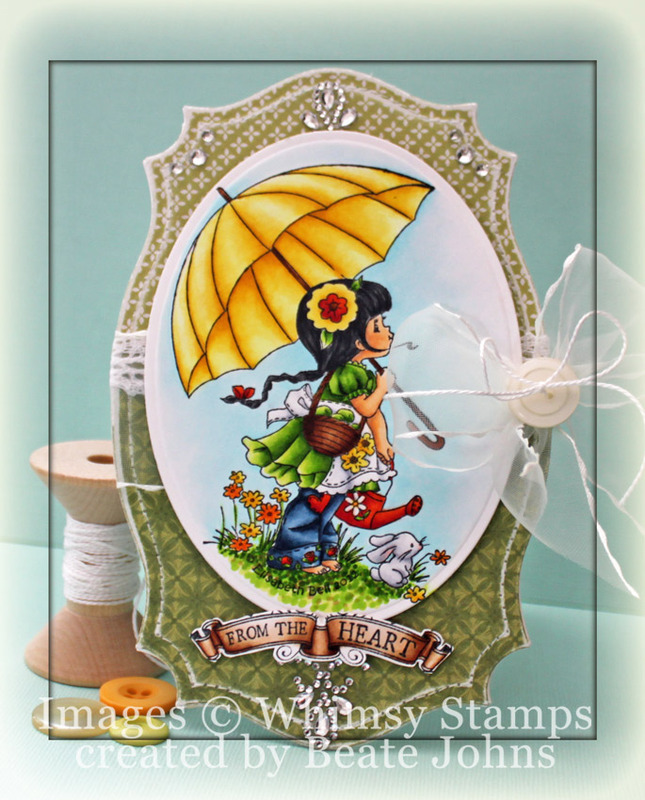 I cut and embossed a heart with a Classic Heart Nestabilities dies out of Cosmo Cricket Odds & Ends paper. It was sanded and adhered to a scalloped heart cut and embossed out of Neenah Solar White cardstock with a Classic Scalloped Heart die. A 2″ wide strip of Odds & Ends paper was adhered to another piece of the same paper pack. The paper was cut and embossed with the smallest of the Grand Circle Nestabilities die. The edges of the paper were sanded and the layers were stitched to a piece of Solar White cardstock that had been hand cut into a slightly larger circle. White Crochet Lace was adhered to the left hand side of the vertical strip before the layers were adhered to the Kraft cardstock card base, cut and embossed with a Grand Scalloped Circle Nestabilities die. The heart layers were adhered to the left hand side of the card. A sentiment from You’re Lovely was stamped in Tuxedo Black Memento Ink on a piece of Solar White cardstock, cut and embossed with a Fancy Tag die. The inner part of the sentiment was sponged with Antique Linen Distress ink and two small flowers of that set were stamped in the same color for added texture. The sentiment was adhered to the lower left of the image and three small Zva Creative Flowers were adhered to the lower left of the sentiment. Parts of a Finesse Rhinestone Swirl finish off the card. Thanks so much for stopping by! Have a wonderful day! I am helping my husband put the finishing touches on painting our living room. It looks so much better now then it did when he started. Hello and welcome to Day four of our December Rubber Die Release Showcase! On Wednesday (14 December) Whimsy Stamps released this month’s rubber designs and new shapeology dies. 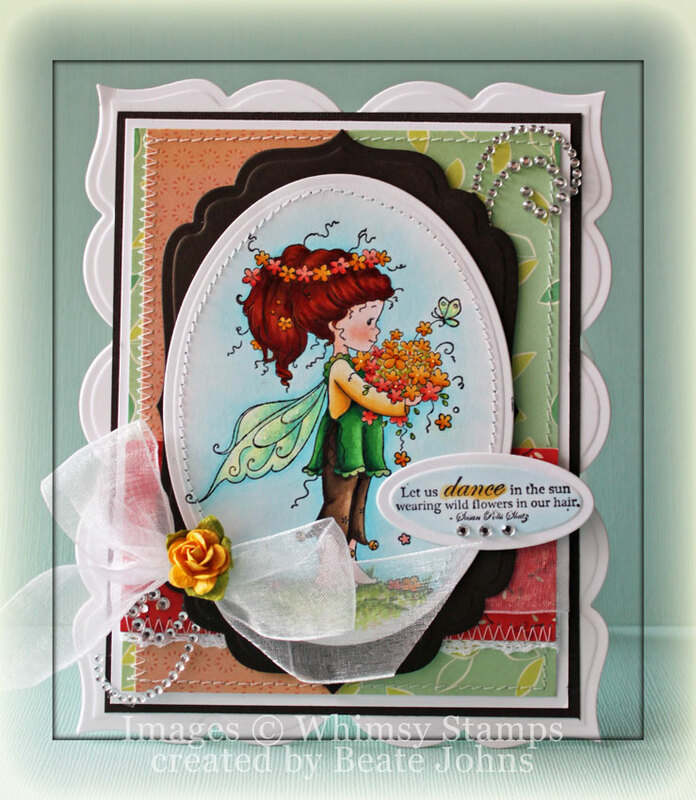 From then until 21 December the Whimsy Stamps DT and Special Guests are showcasing these fabulous new stamps and dies with a daily mini blog hop. Each mini blog hop has a new release prize hidden somewhere along the way and you have 24hrs to enter each prize draw. To be entered into today’s mini blog hop prize draw, be sure to leave a comment on ALL of the DT’s posts listed below by 12.00PM EST tomorrow. All winners will be announced on the Whimsy Inspirations blog blog after 12.00PM EST on 21 December. Today’s card is created with a new the Wee stamp called Spring Bringer. Isn’t she darling? As soon as I saw the freckles on her nose, I knew I wanted to make her a red head. 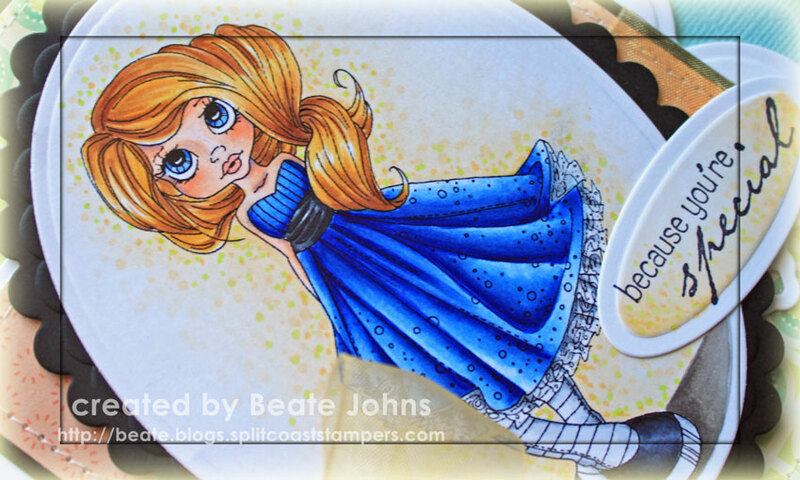 I stamped the image in Tuxedo Black Memento Ink on Neenah Solar White cardstock, cut and embossed it with a Petite Oval Nestabilities die and colored her with Copic Markers (Skin: R000, R01, R20 Hair: E97, E99, E09 Wings: Y00, G00, BG11 Shirt: G14, G16, G28 Shirt: YR30, 1/5 YR31, YR31, BV20 Pants: E42, E43, E44, E47 Flowers: R20, R21, R22, Y21, Y17 Ground: YG01, YG03, YG17, E3o, E31 Sky: B0000, B000, B00). The image was stitched to a piece of Canyon Brown cardstock, cut and embossed with the largest Label 4 Nestabilities die. A piece of White Crochet Lace was stitched to a 1 3/4″ x 4 1/4″ piece of Clementine Cosmo Cricket paper and adhered horizontally over the layers. May Arts Organdy Ribbon was tied over the strip and topped with a Recollection flower. The image was adhered over the layers with dimensionals. The layers were adhered to the card base, a piece of white cardstock, cut and embossed with a Grand Label 23 Nestabilities die . 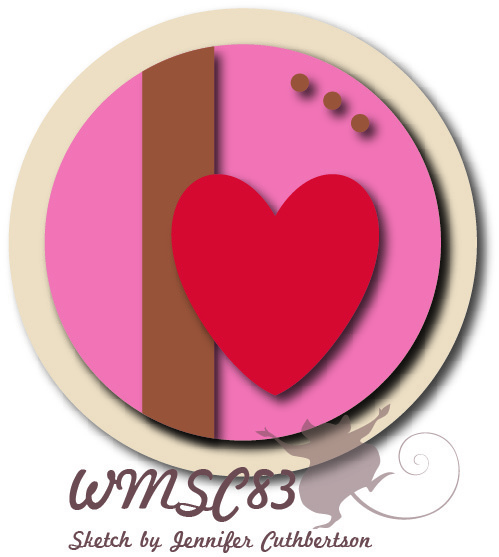 A sentiment from Whimsy’s Spring Letter Seals was stamped in Tuxedo Black ink on a piece of Solar White cardstock, cut and embossed with the smallest of the Petite Oval Nestabilities die. The embossed part was colored with Copic Marker B0000 and the word Dance highlighted with Y21. The sentiment was adhered to the lower right of the image oval. Diamond Stickles was added over the wings and to parts of the flowers. Baby Bling Rhinestones as well as part of a Finesse Rhinestone Swirl finish off the card front. Okay….so I am about 10 hours late posting, but I did it. 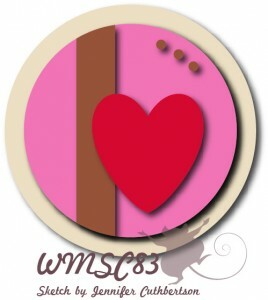 Here is my sample for today’s sketch challenge at the Waltzingmouse Blog. I started out by picking one of the gorgeous patterns of Cosmo Cricket’s Odds & Ends paper. The blue on top of the card was cut with a Grand Label 4 Nestabilities die and adhered to a 4 1/4″ x 5 1/4″ piece of the same paper (other side side). The bottom corners were rounded with the Corner Chomper and a border was sewn around the edges. May Arts Gingham ribbon was tied around the blue layer before the layers were adhered to the card base, a 4 1/2″ x 11″ piece of Kraft cardstock folded in half. The bow was topped with a heart cut out of burlap and a button. A sentiment from Waltzingmouse Rescue Remedies Additions was stamped in Walnut Stain Distress ink on a piece of Natural White cardstock, cut and embossed with a Parisian Accents die. The center was sponged with Antique Linen and the edges with just a hint of Frayed Burlap Distress Ink. A decorative swirl from Fanciful Phrases was stamped on top and bottom of the sentiment with Antique Linen. Baby bling pearls and a pearl swirl from Want2Scrap finish off the card. Thanks so much for stopping by! I hope you have time to play with the sketch! It’s a fun one. Have a wonderful Saturday!